The biblical symbol of the scapegoat helps us understand what God was doing when He allowed (or inspired) Old Testament authors to attribute violence to Him. When we understand that God Himself is the primary scapegoat in Scripture, it helps us see that God is not violent, but He allowed violent people to attribute violence to His name so that He could bear their shame and guilt. “God Himself reuses the scapegoat mechanism, at his own expense, in order to subvert it.” (Girard, One By Whom Scandal Comes, 43-4). To put it another way, God “allowed himself to be expelled so as to make of his expulsion a revelation of what he is really like” (Alison, “Girard’s Breakthrough”). Though innocent of all violence attributed to Him, God allowed the violence committed by others to be laid upon His head so that He might take the blame and thereby rescue and deliver mankind from most of the self-destructive consequences of their sin, and reveal Himself to mankind as a loving Father who takes our sin upon Himself for our deliverance from the consequences of sin and for the sake of our relationship with Him. God “is always ready to pay with his own person in order to spare men the terrible destiny that awaits them” (Girard, Things Hidden Since the Foundation of the World, 208). By being the scapegoat for natural and human violence, God thereby rescues, redeems, and delivers mankind from the disastrous consequences of owning up to what is truly in our hearts. If given a true and complete glimpse of the blackness that resides in our own hearts, some would fall into deep despair and depression from which there is no escape, while others would embrace the evil as a justification for further evil actions toward others. When men get an honest glimpse of the evil that resides in our hearts, we either sink down into death or seek to incarnate the evil even further. When faced with the depths of our own depravity, some die and some kill. God wanted to rescue humanity from either possibility and so He actively allowed men to blame Him for the evil of their own hearts. He bears the burden that no human being can bear. He became the scapegoat for their sin, allowing humanity to lay their sins upon Him so that He might carry their sins away. In order to achieve God’s purposes, God will in effect “get his hands dirty.” It is necessary for God to enter into compromising situations, and work with whatever potential there is, in order to move forward God’s salvific goals. But God, too, will suffer violence in such situations. God will not only absorb the effects of the human misuse of power, but will “look bad” in the eyes of those who think that God’s possibilities should not be so limited (see 1 Cor 1:26-31) (See Fretheim, The Suffering of God, 76). The imagery of the scapegoat comes from the description in Leviticus 16 of the goat chosen on the Day of Atonement to carry the sins of Israel out into the wilderness. On the Day of Atonement, the priest would select two goats and present them before God, and then cast lots to see which would be chosen as the scapegoat. The goat which was selected by lot was offered to God as a burnt offering, while the one which was rejected became the scapegoat (Lev 16:7-10). The priest was to lay his hands upon the scapegoat, symbolically passing all of Israel’s sins upon the goat, and then the goat was to be sent away into the wilderness, where it (presumably) died, taking all the sins of Israel with it into the grave. That God allows Himself to be the scapegoat for our sin is seen partly in the fact that the practice of “scapegoating” is found, not just in Leviticus 16, but in all cultures and all religions throughout history. From sacrificial animals to human sacrifices, all societies sought, in one way or another, to alleviate their own guilt and shame by laying this guilt upon someone or something else. While this often took the form of blood sacrifice, the practice of “scapegoating” is also seen when a culture blames some person or people group within their society for all the woes that fall upon that society. This person or people group is then killed off, enslaved, or sent into exile, bearing the sins of society on their back. Those that remain are able to continue their lives as normal, thinking that the root cause of their problems has been eliminated. The real problem, of course, is within each and every human being, and so it is only a matter of time before problems resurface and the quest for a new scapegoat must begin again. Sociologists, anthropologists, and psychologists have noticed this “scapegoat mechanism” in various societies and cultures around the world and have attributed it to an evolutionary necessity for the survival of human society. Humans need someone else to blame for their sin so that humanity can continue. The practice of blaming others for our behavior enables the survival of society (See Girard, The Scapegoat). Without the scapegoat mechanism, inter-personal violence only continues to escalate on an ever-increasing spiral of retribution and destruction until society collapses upon itself. By bringing blame upon a scapegoat, two warring enemies are able to put aside their differences and unite in the common goal of destroying the scapegoat. The scapegoat bears the blame for what was done, even though the scapegoat is usually innocent of the wrongdoing for which it receives blame. Whether one accepts the evolutionary hypothesis or not, it cannot be denied that the scapegoat mechanism exists in all societies and cultures, and that God Himself used it to help rescue and deliver Israel from the disastrous consequences of her own sin. Could it be that in using the scapegoat imagery, God was not only giving Israel a way of escape for their own violent tendencies, but was also revealing to them (and us) what He Himself was doing about the violence of Israel, and indeed, the violence of the whole world? 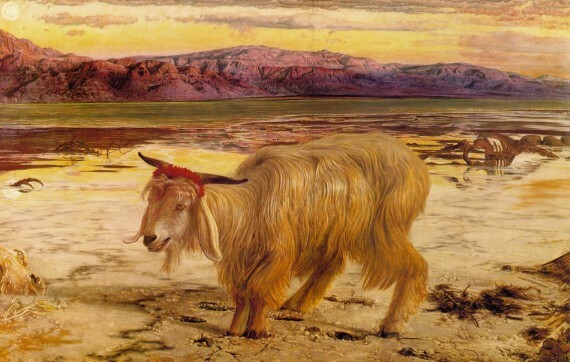 Could it be that the scapegoat imagery of Leviticus 16 that God wasn’t just telling Israel that their sins were carried away into the wilderness by a goat, but that He Himself was bearing their sin on His own being, so that they might be delivered from the ever-increasing spiral of violence that threatened to consume them? Yes, it seems entirely possible. When people wrote that God told them to kill and slaughter others, they were scapegoating God, but He was letting them do it—even inspiring them to do so. God knew that without the violence of the scapegoat mechanism, mankind would only spiral into ever-increasing violence, which ultimately would end in our complete destruction. 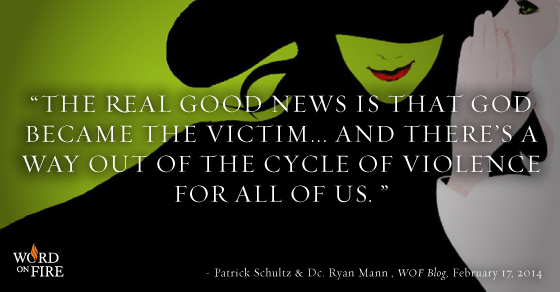 Without an innocent victim on which to pour our wrath and guilt, mankind metes out its violence upon each other in an ever-increasing spiral of violence. God knew this in the Old Testament (and even today), and so allows people to blame Him for the most horrendous actions, not because He has done these things, and not because He has commanded that such things be done, but because He knows that if He does not act as the scapegoat, we will destroy ourselves. God has chosen to bear the people’s sins rather than deal with them on strictly legal terms. For God to assume such a burden, for God to continue to bear the brunt of Israel’s rejection, meant continued life for the people (Fretheim, The Suffering of God, 148). This is especially seen when we consider that much of the scapegoat imagery is carried over into the New Testament and applied to Jesus Christ on the cross. By teaching Israel about the scapegoat, and indeed, implanting the scapegoat mechanism into the hearts of people around the world, God was preparing people for the ultimate scapegoat of human history—Jesus Christ. Jesus, the innocent victim, bore our sins on His own body, taking them with Him into the grave, so that we might not fall into death but might experience the life God intended for His creation. We will look at Jesus as the divine scapegoat tomorrow. Until then, have you ever heard of this “scapegoat mechanism” in studies outside of Scripture and how it serves to allow the survival of human society? What do you think of this idea? Where do you see it functioning in your culture today? Jeremy, know that you are putting in the time and labor to work thru these things. Read your post series on Noah but not all the others and haven’t invested in it like you have. Heart loves the thought that God in his great love takes on himself the violence of man. But my head can’t get past all the bible where God seems to be the source, where he brings violence as his wrath in judgment. Such as. . . “I form light and create darkness, I make well being and create calamity. I am the Lord, who does all these things.” Or even with Jesus at the end of things when he treads the winepress of the fury of the wrath of God the Almighty. Sounds personal to him. If understanding, the thought is that the bible authors were encouraged to write these things about God but that they’re not true. Even limited things like striking dead Ananias and Sapphire. . . understand that as God in his love working for the purity of the church but don’t find any violence intended from man’s side. If I was writing that story would have given a chance to repent. Don’t have any answers, just questions. . . maybe ‘violence’ needs to be looked at differently, not God. Thanks for doing the heavy lifting. . . good stuff man. Thanks, Alan. Yeah, I have lots of questions too, and know that while my attempts at answers will not be satisfactory to all (they don’t fully satisfy me either), I hope that what I write can help move people toward a deeper conversation about these things and a way of viewing God that looks like Jesus on the cross. Takes the power of God to turn and see. . . if that happens, how much grace has come thru you. Have a question for you that is along the same lines but from our end. . . maybe you’ve posted about it already. Twice Paul mentions handing others over to Satan. In Timothy, he hands over two to Satan who made shipwreck of faith so they learn not to blaspheme. In Corinthians he ups it, directing the church to deliver a man who slept with his mother/mother-in-law over to Satan for the destruction of his flesh so that his spirit may be saved. Other than Westboro Baptist, have never heard of a church doing this or have never had it in my heart to do this. Only thing makes sense to me is that in the range of things, violence isn’t the primary factor in viewing things. . . that some things are of higher value than the violence. Is there any place in love for violence if it produces good? I think God is able to discipline without violence … or at least, by one definition of violence. Jeremy, thanks man for the link, really helpful. Had thought it was to death. . . that it is disfellowship on the way to restoration is affirming. Find corruption is active in the flesh and only way forward in this world is in Christ. Seems like believers not living according to Christ would find corruption their default state that wouldn’t need the prayers of the church. Have you ever prayed for this for others? Seems judgmental to do so but maybe just acting in less than others’ best interest in not doing so. Thanks again for making this accessible. I completely get what you are saying here and have said in far earlier posts about God taking the blame, but just as your wife expressed to you, it is a really hard thing to attribute something to the text (that God inspired the writers to attribute all the violence to him personally and as if directly from his mouth) which isn’t expressed in the text, whereas it’s expressed all over what Jesus did in taking the blame innocently. So on the one hand, God makes it quite clear what’s going on, and on the other hand, you have to implicate God with something that is never given a hint of in scripture. Not that it isn’t an interesting idea, just that it feels like a stretch, ya dig? I am not quite sure I understand what you are saying. I do agree that the innocence of God is not expressed all over the place in the OT, but since I am trying to understand God in light of Jesus Christ, and since the innocence of Jesus Christ is expressed all over the place, then this is why I try to read this innocence back onto God as well. I know it’s a stretch, but that is why I spent so much time laying down some of the theological and hermeneutical principles earlier in this study. ahh, I see, the reading Jesus’ innocence back into the OT makes the sense I needed. Still, there is difficulty in the “direct” quotes plain text of what God said or was attributed to have said in numerous places. Please continue the series I’m enjoying it! This very question has caused severe wrestling in my faith this past year… I have to say that this is a fascinating explanation of God’s ‘violent tendencies’ in the Old Testament. Oh how I’ve desired to reconcile Jesus with the God of the Old Testament! I really appreciate the perspective of looking at the Bible ‘backwards’. It really does make sense, and I wholeheartedly agree that those who haven’t wrestled to understand the ‘violent’ God of the Old Testament must missing something when they are reading! I am working toward a way of explaining this in a more clear and concise way. Stay tuned!